The Edo State Government has ordered the arrest of one Kingsley Edebiri, an official of the State Public Works Volunteers (PUWOV), over alleged extortion from unsuspecting motorists in Benin City, Edo State capital. 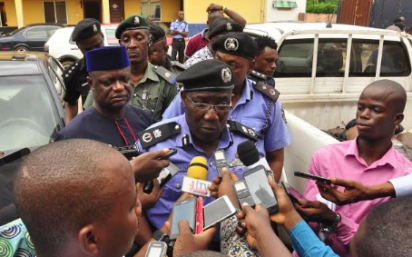 Edo State Commissioner of Police, Mr. Johnson Kokumo, addressing journalists at the State Police Headquarters, in Benin City, on the foiled robbery attack on a bank in Igarra, in Akoko Edo Local Government Area of Edo State, on Friday, August 10, 2018. Addressing journalists at the Government House in Benin City, the Coordinator of PUWOV, Mukhtar Yusuf-Osagie said he had been receiving calls from motorists over cases of extortion by volunteers with the programme, and had warned his men to desist from such act.